The Montecristo Classic Series are hand-rolled premium cigars produced with high grade US Connecticut shade wrappers. Each of these fine cigars are individually constructed by skilled cigar rollers using the finest premium blend Dominican fillers and binder tobaccos. Montecristo premium cigars are well-balanced throughout giving off a mellow taste of the right sweetness that provides a great smoking experience to every user. 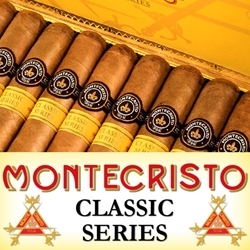 The Classic Series is considered the best of the Montecristo brand. Smokers Discounts offers Montecristo premium cigars in numerous varieties of sizes and flavors. Each of these styles are available here at our discount online cigar store today.